This 392 acre property contains a wide variety of upland forest habitat and steep ledges and is owned by the Androscoggin Land Trust. Previously partially conserved through a long-term conservation lease with Verso Paper, ALT purchased this and other properties in October 2014 as part of our Androscoggin Greenway Community Forest Project with generous funding from Land for Maine’s Future and numerous private foundations. We manage the lands for wildlife habitat and recreation while practicing sustainable forestry. There is a multi-use trail that runs through the center of the property which is maintained by Canton Trail Riders, Western Maine ATV and Brettuns Wheelers ATV Clubs. 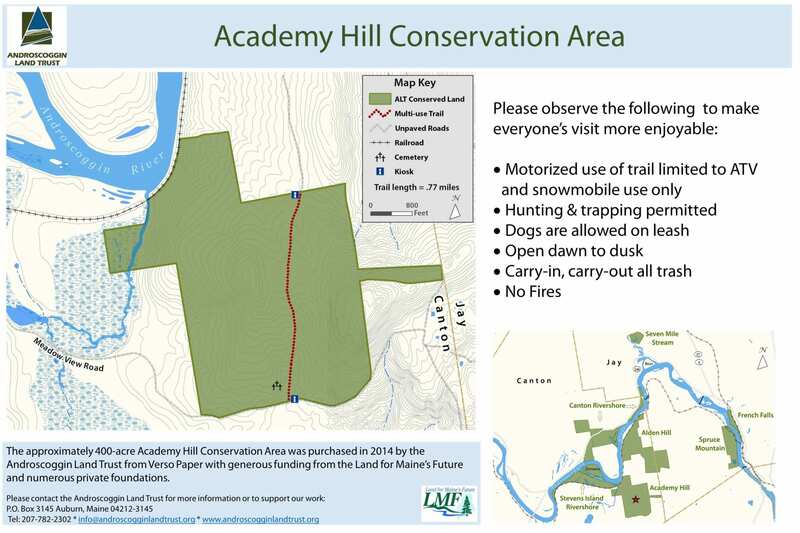 Directions: Academy Hill Conservation Area is accessed via Alden Hill Road off Crash Road in Jay. Follow Alden Hill Road approximately 2.3 miles from the intersection with Crash Road until the road is no long passable by most vehicles – there will be homes nearby and on the right there is a small turnaround area next to a mailbox, which can be used to park in. From here bear follow the road, it will appear as if you’re going into someone’s yard, and then follow the road as it bears left for approximately .5 miles until a small wooden bridge is seen, followed by a gate to prohibit truck traffic. The Academy Hill Conservation Area begins here and is accessed by the former road that continues past the gate.